Special things: Sarah is praying the rosary every day of the blog tour. Also, there is a Nook giveaway sponsored by Ave Maria Press. See below my review for both. So many of the crosses I have are made heavier by my approach to them. Instead of just walking along and dealing with them, I spend energy complaining, dreading, and trying to avoid them. Rather than offer them to God or--better yet--rather than asking him to help me, I try to do it just like my toddler insists, "By myself!" When Jesus carried his cross, it wasn't easy. But it did end. Our crosses aren't forever. If there's an aspect of your pregnancy that is a cross for you, turn to this mystery in a special way. Ask Mary to help you turn your focus toward the One who stands ready to help you carry it. Full disclosure: Sarah is a friend of mine. Second full disclosure: That didn't make me want to read this book. Final full disclosure: When forced by the bonds of friendship to grudgingly read it, I loved it. Now, that's a good book! This is not a "what to expect when you're expecting" book, although some of those elements are contained within. This book feeds the inner mother-to-be as well as reassuring her about the outward changes she encounters. Covering the pregnancy week by week, Sarah Reinhard discusses physical changes for mother and baby, but then goes on to reflect on a mystery of the rosary as seen through the lens of that stage of pregnancy. She then encourages the reader with a small faith-related task to focus on for the week and then highlights an element of the Catholic faith. As Catholics, we begin and end every prayer with the Sign of the Cross. It's part of our faith tradition. this week, focus on the Sign of the Cross as a prayer in its own right. Trace a cross on your husband's forehead before he leaves for work (if that's too weird, simply do it in your mind), and tell him you are praying for him. For many husbands, seeing the discomfort of their wives at the end of pregnancy (and during labor and delivery) is a version of standing at the foot of the Cross. Ask Mary to remain close to you and your husband as you journey closer to meeting this baby. Labor and Delivery, and Baptism both have their own sections with similar combinations of practical and spiritual guidance. A few sections contain features written by women with a unique experience of motherhood, such as The Unexpected Child or The Joy of Mothering Many. All of the book is imbued with Reinhard's practical experience and inspirational reminders. Reinhard is reassuring, down to earth, and sympathetic without ever being sappy or unrealistic. This is a book that I'm going to be giving to many of my friends who are young mothers. Certainly I will be handing a copy to each of my daughters when they are at this point in their lives. Highly recommended. Be sure to enter to win a Nook (and any number of other goodies) each day of the tour over at Ave Maria Press. Jesus was the Son of God. He didn’t really have to obey the law, because he was the law giver. In the Presentation, where Joseph and Mary take Jesus to the Temple to be presented to the Lord, we see him doing just what he didn’t have to do, though: obeying. It’s a word that’s not common anymore and it certainly isn’t popular (if it ever was). Being obedient is equated with being run-over or brainwashed. It’s not usually painted in a favorable way. And yet, in the Presentation, we see Jesus’ example of obedience through his parents. They committed him to God, even though they knew he was the SON of God. In our own lives, obedience is often subtle, sometimes even invisible. It might mean skipping a fun night out because of a family obligation or not watching a show because of a holy day Mass. It could be listening to the still small voice of God in your life, or it could be eschewing something that leads you to sin. What does obedience look like in your life? Examine it this week with the help of a spiritual friend or advisor. Look to Mary and ask her for guidance. 10 - Hail Mary . . .
That first bit about Jesus carrying the cross is one of my favorite bits of the book. 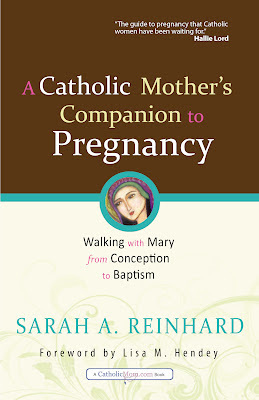 It is exactly where I was in the beginning of my first pregnancy and the only Catholic pregnancy book I could find kept blathering about the joy and serenity and fruitfulness of pregnancy. I wanted to throw it across the room because while those were all true in one way, in another way I was too burdened with carrying the cross to be able to hear it. I needed to find someone to acknowledge that pregnancy could be a cross and to help me find a way to offer it up in prayer. I so wish I'd had Sarah's book back then! Of course the wonderful thing about her book is that if that's not your experience, if your pregnancy is easy and joyful, then there is also a lot of meat for you in it too. God richly blesses obedience for the sake of His Kingdom. God bless you, Sarah and Julie, for obeying that still, small Voice that has you blogging for the Kingdom of God.